If you’re looking for a venue with authentic Mexican details, then Hacienda Cocina y Cantina may be the place for your destination event! 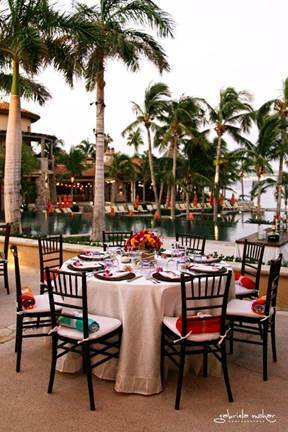 Located right on the sand at Medano Beach, there are several different event spaces available here with amazing views of the Sea of Cortez. For this wedding reception set-up at Hacienda, our client Kay wanted lots of vibrant color combined with the natural look of wood chairs and wicker details. 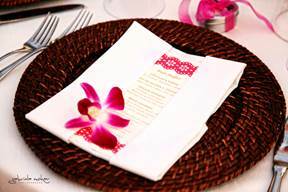 We customized special menus for this décor that went perfectly with the bright color palette and wicker chargers at each place setting. The stunning fresh flowers from Cabo Floral Studio really brought everything together and completed this rustic chic look! A special thanks to Gaby Cobians of Vivid Occasions for trusting us with this special day, and to Gabriela Mohar for the fantastic photos, as always! 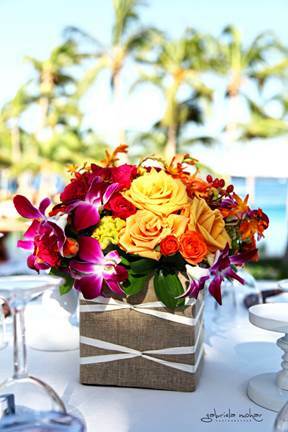 This entry was posted in Cabo event design and decor and tagged bright color palette, Cabo beach wedding decor, CABO FLORAL STUDIO, Cabo linen design and rental, Cabo wedding planner, colorful Cabo wedding, destination wedding decor, Gabriela Mohar, Hacienda Cocina y Cantina, Mexico wedding, natural wedding decor, pink and orange wedding decor, Vivid Occasions, wicker charger.